BMW E46 M3 is an old car, is it worth to upgrade the factory BMW E46 radio with an aftermarket navigation head unit replacement? The answer is yes. Most BMW E46 comes with business CD and radio not with a large screen to support DVD playing and rear view camera video, even with a 7 inch factory BMW E46 screen unit the resolution is not so clear compared with aftermarket touch screen head unit, besides, with a cheap price you can upgrade and install the BMW E46 navigation head unit to replace the old BMW E46 radio, so you can also enjoy music and video playing via car DVD player, USB, SD, Music app and also online music and videos. 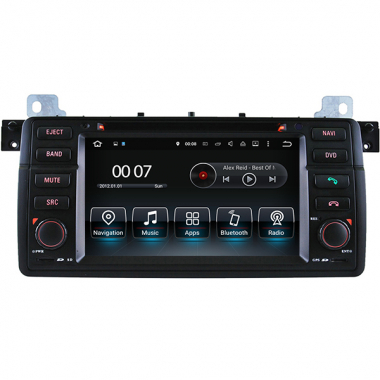 Android BMW E46 radio navigation is your best choice for a replacement. It's with Android 8.0 system, Octa-Core high speed CPU processor, 7 inch large high definition 1024*600 resolution capacitive screen, besides, the BMW E46 navigation supports steering wheel controls, supports rear view camera video input, supports wifi connection to download and install your favorite Android apps, plus Apple car play function for both iPhone and Android phones. Including BMW 316i, BMW 318i, BMW 320i, BMW 323i, BMW 325i, BMW 328i, BMW 330i, BMW 318d, BMW 320d, BMW 330d, BMW M3 model. Plug and play installation, both 17 pins and 40 pins plugs included. If you buy BMW E46 navigation from Cars-electronics.com, we will install Android GPS maps(Sygic or iGo) for you together with a 8GB TF card, our maps are free to use, maps update is also free when available from us. Installation is very easy, you can even remove the factory BMW E46 radio and install this new Android BMW E46 head unit by yourself, many of our customers installed this Android head unit by themselves without paying the installation fee to a car stereo shop. Besides, if you have any questions while installing, we are more than happy to assist you by providing you useful installation instructions and photos, so you don't need to worry about installation. Our BMW E46 radio Android head unit is with high quality, 2 years warranty, we will test it well before the shipment. If you have any questions, just feel free to contact us, our customer representatives will reply you very soon even on holidays.